I recall a Sunday afternoon performance by young thespians from Davao City at the regally cavernous Hall of Liberty set at the elevated end of beautiful Forest Lawn Memorial Park in Hollywood Hills. It was about the Catholic church’s Padre Diego (Blessed Diego Luis de San Vitores) and his young assistant Pedro Calungsod spreading the gospel to the Chamorros in 1672 in the Marianas. Their proselytizing greatly enraged a local headman, which led to their persecution and ultimately death. That Godspell musical I saw a decade ago was a poignant retelling of the joy, the heroism and travails of pioneering missionaries who unhesitatingly traversed under harsh conditions even to uncharted places equipped with nothing but good intentions and the strength of their faith. The musical was taken from The Life and Martyrdom of Blessed Pedro Calungsod, a handiwork of famed Cebuano Msgr. Rudy Villanueva in response to the call “to propagate and promote the life story” of the then recently beatified Calungsod. The young Calungsod officially became San Pedro Calungsod de Cebu October 21 following canonization rites in the Vatican led by Pope Benedict XVI. Calungsod is now in league with his countryman San Lorenzo Ruiz, who was canonized in 1987. Catholic Philippines erupted with joy when Pope Benedict XVI declared Calungsod and six other new saints worthy of veneration by the entire Catholic Church. It was a day of joy for thousands of Filipinos who attended the canonization mass at the Vatican and those who watched the rites on television and digital streaming in the homeland. Thanksgiving celebrations were held in various churches in many places throughout the Philippines and among Filipino migrants elsewhere in the world. 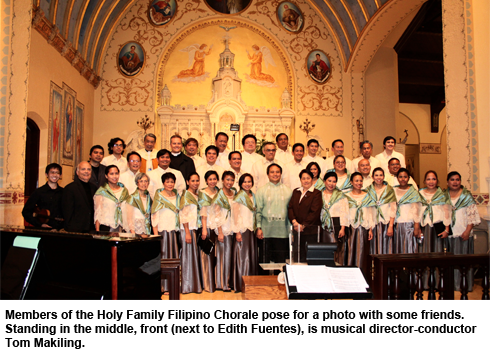 In Glendale, a city next door to Los Angeles, the angelic voices of the Holy Family Filipino Chorale (HFFC) were raised to heaven on November 10 as the Holy Family Catholic Community Church celebrated the new saint with “Pedro Calungsod The Boy Who Would Be Saint Thanksgiving Concert.” The HFFC was joined by The UP Concert Chorus Alumni of Los Angeles in singing the Angelus and on to Tu Es Petrus, O Magnum Mysterium, Aba Ginoong Maria, Ave Maria, Prayer of Saint Patrick, Gloria, Panis Angelicus, Ang Panalangin ng Panginoon, Kordero ng Diyos, Prayer of St. Francis, Gaelic Blessing and For All the Saints. HFFC is headed by its musical director-conductor Tom Makiling, a graduate of choral conducting from the University of the Philippines. 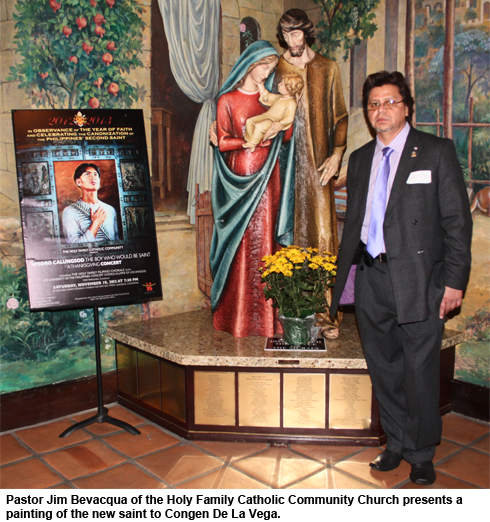 At the Immaculate Heart of Mary Parish Hall in Santa Monica Blvd., the Filipino Priests Association of Los Angeles had a press conference November 16 about their musical play: Life Stories of St. Pedro Calungsod and St. Kateri Tekakwitha. 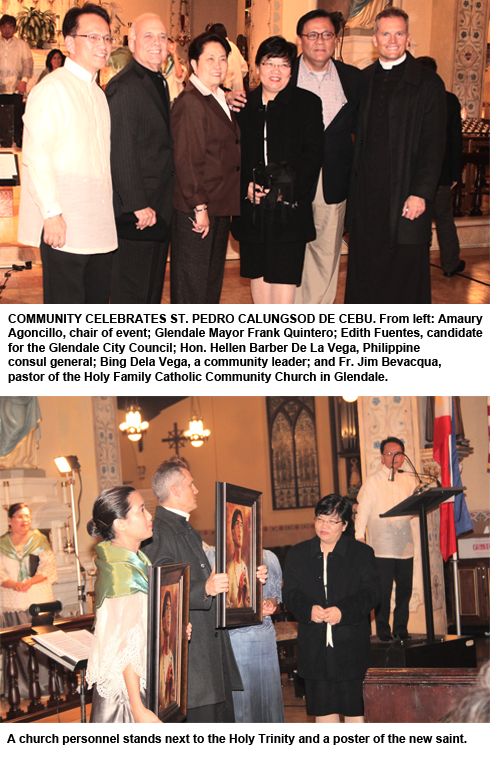 And on November 30, a thanksgiving mass was held for the new Filipino saint at the St. Genevieve Church in Panorama City with Most Rev. Alexander Salazar, D.D., Vicar of Office for Ethnic Ministry, as principal celebrant and Most Rev. Oscar A. Solis, D.D., Auxiliary Bishop of San Pedro Pastoral Region, as Homilist.